The Aardvark looks a bit like the South American anteaters but they are not related. 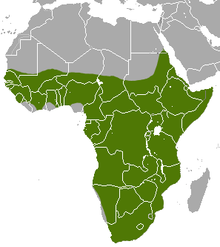 It is in a proposed clade Afroinsectiphilia, with the golden moles and tenrecs. Another proposal is to out it in the Pseudungulata, with the elephants and Sirenia. There is no consensus at present. Adult aardvarks weighs about 60 kilograms (130 pounds) and a little more than one meter (45 inches) long. Aardvarks eat mostly ants and termites. They have a long sticky tongue which makes it easy to pick up many ants at once. Aardvarks are nocturnal, which means they are awake at night and asleep during the day. Wikispecies has information on: Orycteropus afer. This page was last changed on 23 September 2018, at 01:21.